This particular model has a 3-1/2" Open top, which can also adapt to regular (non-retro) items as small as 3-5/8" OD items. FASTENERS AND SEALANT: Includes stainless steel clip fastener for closing/sealing the side. Screws and sealant for attaching to roof are not included. Additional M1 or Dualink sealant is recommended at bottom, side seal, and top. 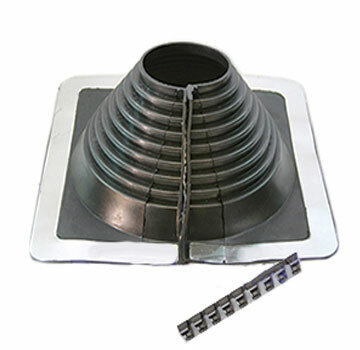 OPTIONS: Available in sizes to fit 1/4 to 26" OD pipes, and in either Gray or Black EPDM, or high-temperature Silicone.